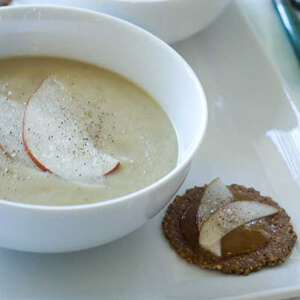 "The soup certainly sounded interesting, but we thought it might be too sweet with both pears and sweet Vidalias. The curry and chicken broth really balance it out," says Wendy Brannen, Vidalia Onion Committee executive director. "And, I loved that this soup was so delicious yet different when served cold in the heat of summer." 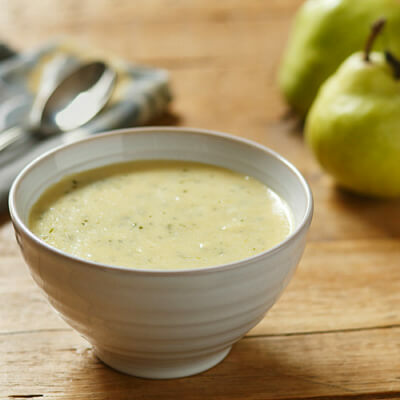 The growers of USA Pears love this recipe for its inclusion of their favorite fruit! Thanks, Joan! In a 2 quart, heavy-bottomed saucepan, melt the butter with the oil over medium heat. Add the Vidalias and pears, stirring to soften, 2-3 minutes. Sprinkle over the curry powder and salt. Stir for another minute until the curry is fragrant. Return puree to the pan and add the cream and honey; heat through. Whisk in the yogurt and half the chives. Serve immediately, sprinkled with the remaining chives. Or better yet, chill the soup thoroughly and serve in chilled bowls, sprinkling with the chives.